Most organizations rely on surveys and other traditional self-reported approaches to determine unmet education needs. Yet the responses from these approaches often does not align with data such as quality metrics. Companies have leveraged Kynectiv's simulation platform to better assess knowledge and performance gaps by placing participants in real world scenarios that replicate the situations they encounter. Gaps and needs can be more accurately and objectively measured by collecting data on the participants’ actual decisions, rationale and confidence within the simulation. At a large health system, quality data indicated that there was a higher than acceptable incidence of missed or delayed diagnosis of stroke in the emergency department. Simulations were used to better understand the decisions made by emergency medicine clinicians when treating a patient who presented with symptoms of stroke. Data were collected on clinicians' diagnostic accuracy, confidence and the cost of labs, tests and imaging studies. Additionally, treatment and admission decisions were captured. These data led to the identification of gaps in practice behavior that contributed to the missed or delayed diagnosis. Simulations were then used to help address those gaps with meaningful results. 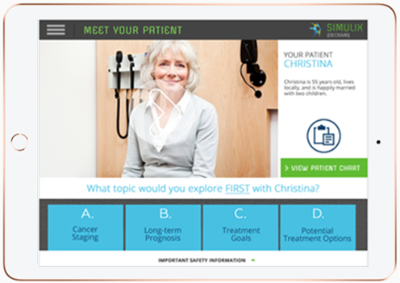 A pharma company leveraged the Kynectiv platform by placing clinicians in a scenario in which they treated multiple patients including ordering labs, tests and tissue analysis and selecting a treatment plan. Decisions were captured and the storyline changed based on those decisions. The story moved forward in time to allow the clinician to assess the disease progression and response to the therapy selected. Data from the simulation helped the client identify three major practice gaps that confirmed findings from other research efforts and more specifically pinpointed the needs. In addition to improving your needs assessments, Kynectiv's simulation platform can also be leveraged to educate and train clinicians and measure the the impact of the training on knowledge and practice behavior.